Combine cilantro, garlic, chile, and walnuts in a blender or processor. Add 1/3 cup lemon juice, salt, pepper, and cumin and process to a smooth paste. Add water as needed to make the sauce pourable. Taste for seasoning, adding salt, pepper, and lemon juice as needed. Serve immediately or within 4 hours a room temperature. Sauce can be refrigerated and reserved the next day, but it is best fresh! I tried this recipe last night. Had mixed results.Guess I'll play with it & adjust the seasonings a little. Found it to be a bit strong but different. I tried this recipe yesterday and result was good. It is actually little different what we prepares in India, but the twist of adding walnut is brilliant. We use fresh mint leaves in place of walnut and rest are same. though it may be little strong but you can give a try. Delicious - will make whenever I have extra cilantro that might go to waste! I like the fact that all the ingredients are usually around the house. I absolutely love this sauce. I've served it three times since I first tried it, and expect to serve it that many times again in the coming year! 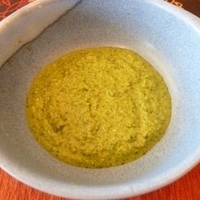 I'm curious -- why is this called coriander sauce when there's no coriander in it? Good question, Ariel! Coriander and Cilantro are the same plant..though normally the seeds are referred to as coriander and the leaves as cilantro. I guess I could have called it cilantro sauce...would have been more intuitive. Can't wait to try this! We've visited India, and we love their food! Would love to go back! Tried to get them to share recipes but it gets lost in the translation! Thanks for sharing!